One of the most important things you can do when you plan on camping, hiking, or backpacking is to know the weather in the area in which you plan to camp. By doing so, you can prepare yourself by having items ready for when the weather dips down into cold or freezing temperatures. Here, we are going to discuss tips on sleeping in a cold tent, and how to stay warm when the temperatures are frigid. You want to ensure that you have all of the right gear that will keep you warm through the night. With the correct gear and being well prepared, you will appreciate your journey much more, as you will be sleeping warm and comfortably. Warm clothing, such as fleece, can mean the difference between chattering your teeth freezing and being comfortable in the cold. 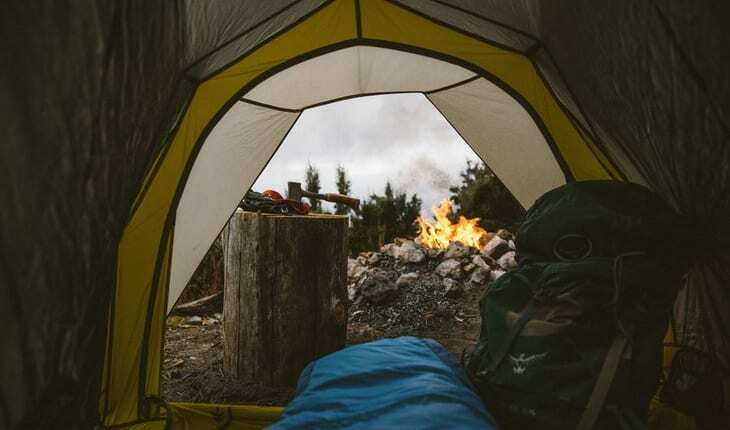 While some of these tips might seem like common sense, some may be new to you, so consider each item and think about if it is right for your next camping trip. 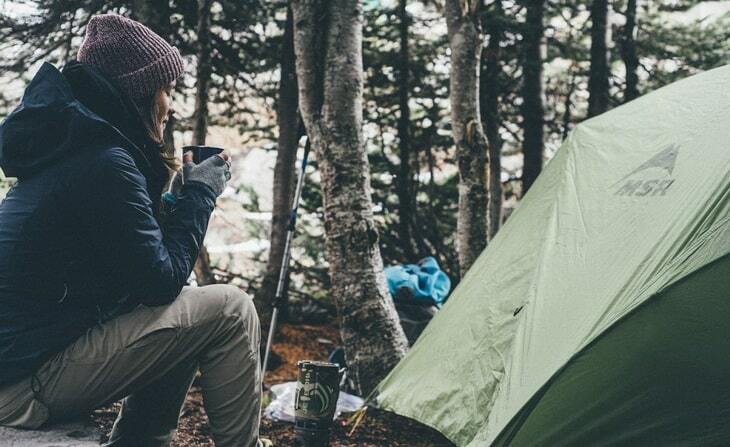 By considering some features, and being armed with the knowledge of these tips, your next chilly camping adventure can turn out to be warm and comfortable! Before you take a camping trip during the winter, or during the times of year where temperatures drop far at night time, you will want to take some time to think about what you need and what you an do when it gets cold on your journey. Gear is highly important when it comes to camping in cold weather. You will want to have a sleeping bag that is well insulated and made for negative degree weather. Taking along a car camping bag or a backpacking sleeping bag can be helpful as they are comfortable and will keep you warm. 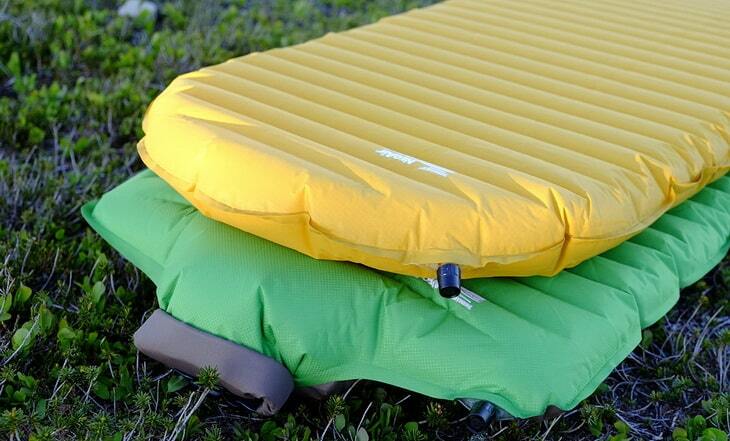 Bring along a sleeping pad for comfort and to be off the cold ground. Pillows can help keep your head warm if they are made from fleece or down comforting. If there is a lot of wind or earthy noises around, you can bring along ear plugs to reduce the noise level and get proper sleep. For the best backpacking sleeping pads, see our article on the topic to learn. In cold weather, you will want to have 3 layers of clothing on. The bottom layer should be insulated like long johns. The middle layer can be a fleece shirt and then the third layer should be protective gear, like a warm coat good for outdoor use. This will help keep you warm in cold temperatures. Here’s a list of the best layers for clothing to give you more options. Of course, you can also add hats, gloves and other warming items to that list. Try to wear socks that have wick in them so you do not sweat through them. Find a good tent site on a flat area that has no debris like sticks and rocks. Bring along a headlamp or flashlight so that you can prepare for bed. Do your nightly routine that you would at home (brush your teeth, brush your hair, grab a bottle of water if you are thirsty at night). Be sure that all of your food and toiletries are outside of the tent. This way, if a bear or other animal comes along, they will not be trying to break into your tent. Be sure you are wearing clean and dry clothing to bed. Wearing long johns and socks should cover it. You do not want to over dress during this time. Go to the bathroom before you settle in, as you do not want to make a trip in the middle of the night to go outside. You can also use a bottle or can to urinate in. Do not panic if you hear noises outdoors in the night time. As long as you have stored everything properly and done what you can, you should be fine and can wear ear plugs if there is too much noise. Below are the 11 tips on staying warm if you are caught up in some cold, freezing weather. Adhering to these tips can help you stay warm during the night, and allow you to sleep a lot better. 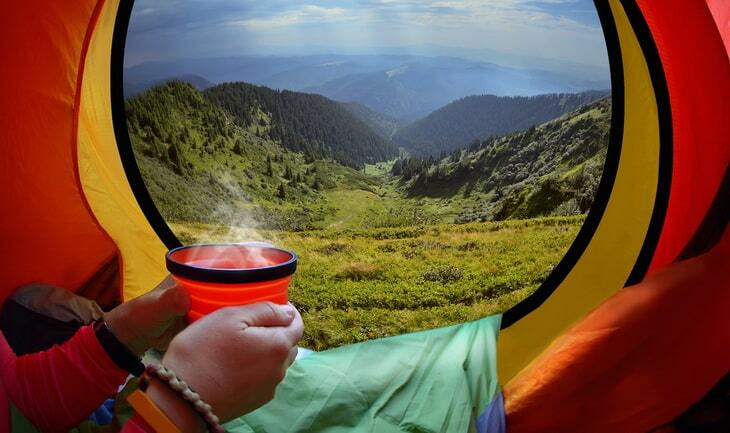 After you have selected a good camping site, you want to ventilate the tent off of the ground. Find a spot that is out of the wind. The body heat you give off does cause condensation within the tent and will make things damp, which causes the tent to get cold. As long as it is ventilated, you will not get any condensation and the tent will stay dry, which means it will stay warmer. 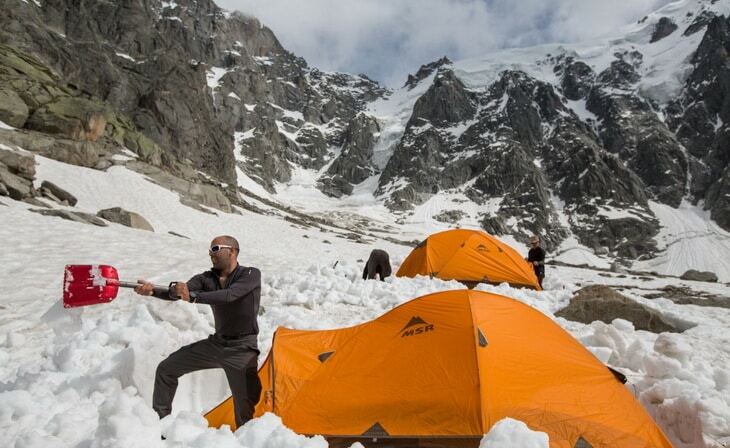 In order to learn how to pitch your tent with care, see our article on this topic. Be sure your site is free of any debris so that you do not have an uneven area in which you are sleeping. Many people do not think of bringing along a space blanket, but really, it can be helpful when attempting to stay warm. Space blankets will reflect heat back to your body, and is also known as an “emergency blanket”. You can simply attach it to the top of your tent with duct tape, and the heat will come down to your body and heat the whole tent, which keeps you and your camping partners cozy warm all night long. It cannot be said enough that you need a really good sleeping bag when you plan to camp in frigid temperatures. Find one that is temperature rated (some go up to -30 degrees and more) and made of quality materials that will last and keep in the warmth. 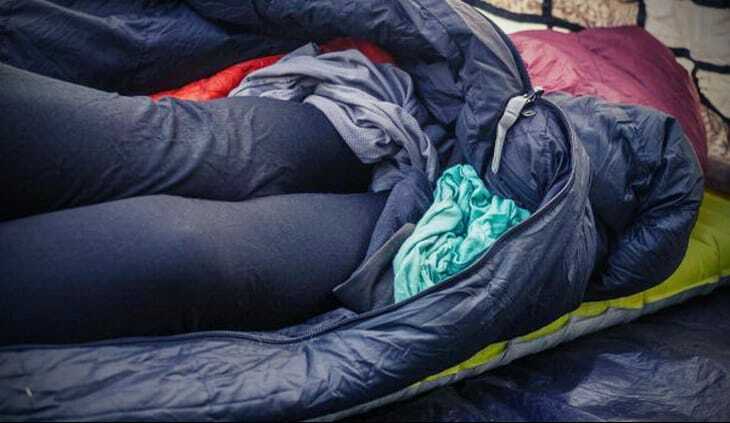 If your sleeping bag is temperature rated, but you find yourself still chilly, you can bring along a sleeping bag liner to add up to 10 degrees more of the heat. Be sure to air out your sleeping bag, and liner, each day by rolling it up food to head and leaving it open so that the air can cool it out. 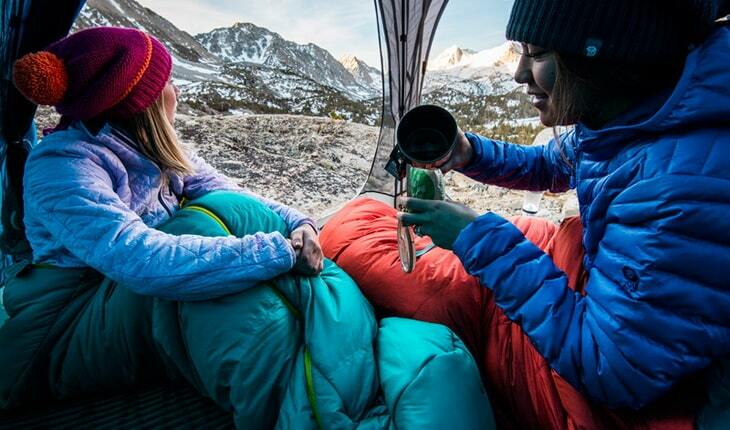 When you go to use your sleeping bag the next night, shake it out and fluff it up before you get inside of it. 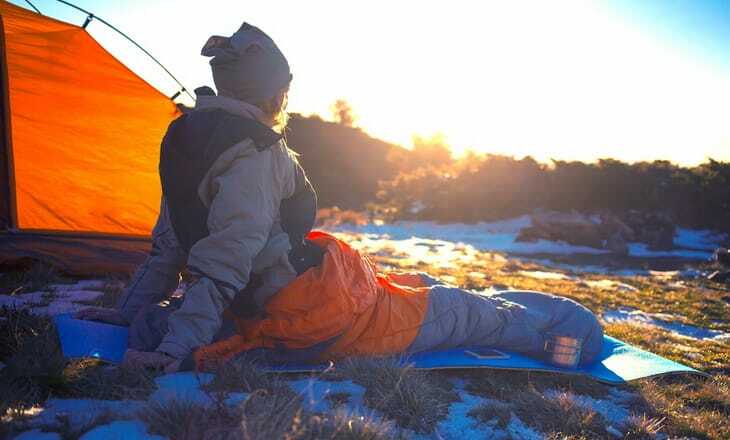 Find yourself a durable and insulated sleeping pad to provide padding between you and the cold ground. Experts say that having warmth on the bottom of you is more important than on the top. Sleeping pads are more insulated than if you were to use a regular air mattress, because those are not insulated at all. If you do want to use an air mattress, use a sleeping pad between you and it so you can keep warm through the night. 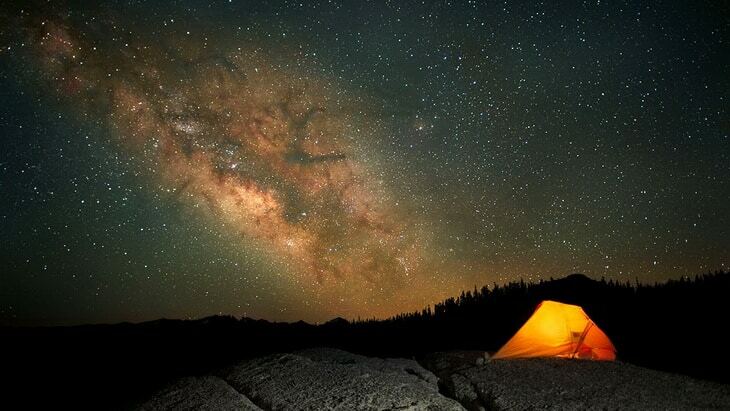 Remember, getting a good night’s sleep is very important when you are camping and doing other outdoor activities. Before you turn in for the night, you want to be sure that your feet are clean and dry. You can use some dry socks for sleep to keep your feet dry. If your feet are damp, or the socks are damp, you can lose heat through your feet because dampness means there is moisture, which causes cold feelings in the body. Keeping your feet warm is important for the whole body as you tend to lose the most heat through your feet and hands. Keeping these parts warm will keep the rest of you warm as well, for the most part. If your feet tend to get cold, you can bring along a half bag that heat the feet and legs and uses a drawstring to keep it closed. 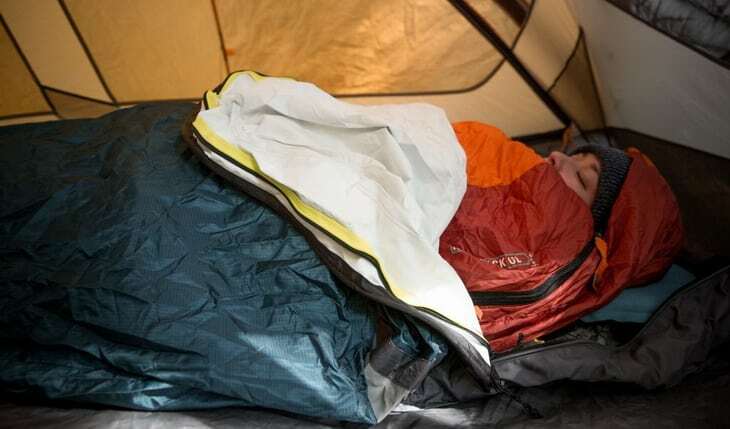 If you find yourself in a pinch, use a piece of insulated clothing at the bottom of the sleeping bag. When you breathe, you are exhaling moisture, and again, moisture means you are going to be cold. This is why you do not want to put your face inside of your sleeping bag, not to mention your body could overheat. Keep your nose and mouth outside of the bag. If your face is very cold, you can use a scarf or a light face mask to keep warm. Stocking hats work well too, to keep heat from leaving your head. Being too warm means you can sweat, which means you will feel cold and wet soon enough. If you find yourself getting warm, you can open up the sleeping bag a little bit or take off a layer of clothing. As we mentioned before, you will need to wear layered clothing, but it is important to heat the body before bed by going for a brisk walk or doing some light exercise to get the body heat active. Then get in your sleeping bag and you will retain heat better. You can also cuddle up to your mate at bed time to retain body heat for both of you. During the day, you need to stay properly hydrated so you do not get overheated. 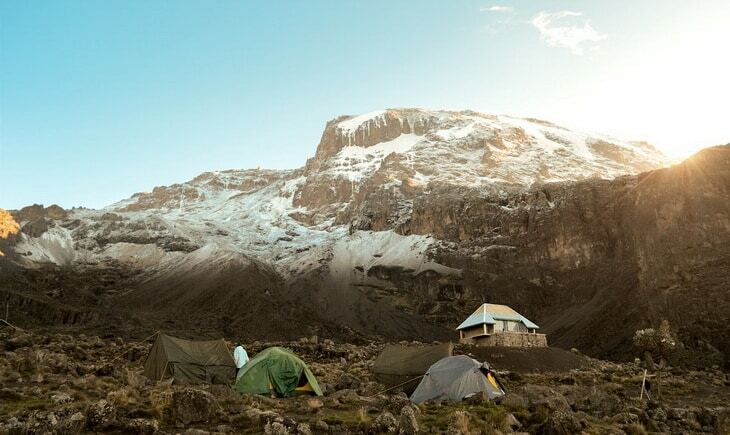 At night, try not to drink a lot of fluids so that you do not have to leave the warm tent in the middle of the night, or use the urinating can, you brought along. Keep some water next to you while you sleep so you can drink some if you get thirsty at night. The water should stay cold on its own if the weather is cold outside. Calories are, in essence, part of the heat. Your body stays warmer when it has a lot of calories. At dinner time, you should eat foods with a lot of calories so that you can stay warm at night time. One good idea is that if you wake up hungry at night time, you can reach for a snack next to you for more calories and renewed warmth. While you should store your foods outdoors safely, you should also store it safely in the tent in case bears or other dangerous animals come along and try to get your food. Using containers that seal and are air tight will keep the scent away from animals that might come lurking for a midnight snack. You can fill a water bottle with hot water before you tuck in for the night and place it in any colder areas of your sleeping bag. If you do not have a water bottle to use, or hot water, you can always use hand warmers, or heater packs, both of which are disposable. You can place these in your sleeping bag as well, or use them in your hands. Some old school campers would heat rocks at the campfire and put them in a sock and then put them in the sleeping bag. As long as the rocks are not too hot, you can feel free to try this method out. See our article on the best water bottle for the outdoors – it’s a must read. 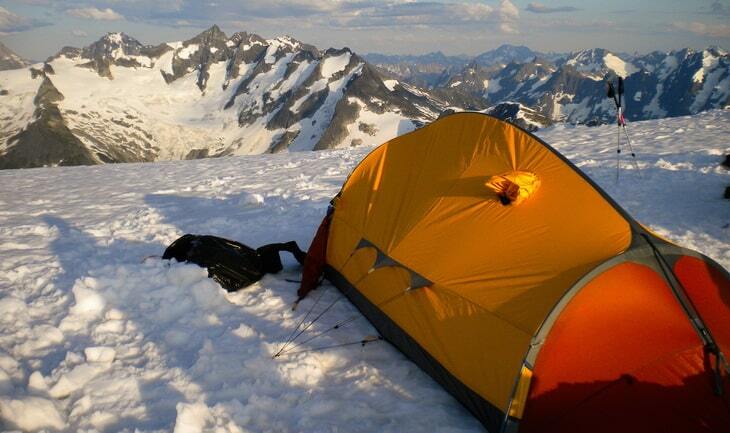 If you have to use the restroom at night, you do not want to let out the warm air by opening the tent to do your business. This also makes your bed space colder, and you will have a harder time getting comfortable and warm again. Instead, you can use a urine bottle or a can to do your business in it, and keep it inside the tent for later proper disposal. Do not hold in your urine, because your body will use those heating calories to heat the urine in your bladder. So if you have to go, go in a container inside of the tent so you can retain as much heat as possible. What Do Others Think of These Rules Tips? The campers say that adhering to these tips will surely help keep you warm at night. By staying in the tent, you are not risking the cold elements entering the area, say if you were to leave the tent to relieve yourself. 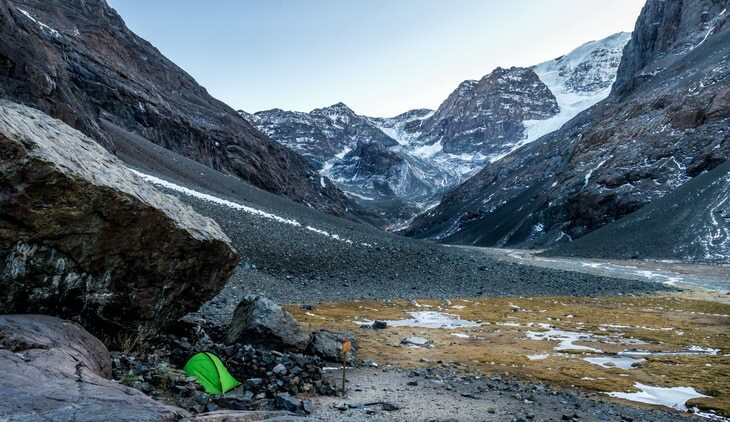 While it might seem a little gross keeping urine inside of your tent, you will be much more comfortable with the head inside and you can dispose of any waste in the morning. They also say that having warm and insulated gear, helps you get a great night’s sleep. Overall, campers adhere to these tips and have achieved success on staying warm on those cold, freezing nights. Some campers like to implement that is newer to the camping world. They are camping heaters. You can take them with you when the weather is frigid, and you can find them in an electric version or a propane version, so you get to choose which version you like better. The thing about these items is that you should not ever sleep with the camping heater on. 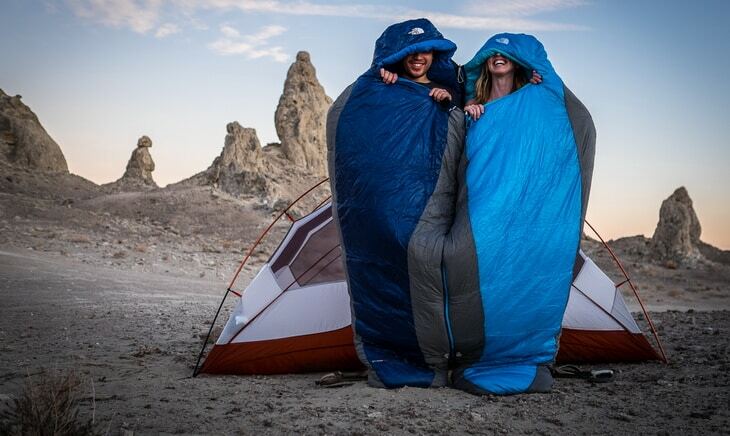 These need to be used to strictly warm the tent before you go to sleep. 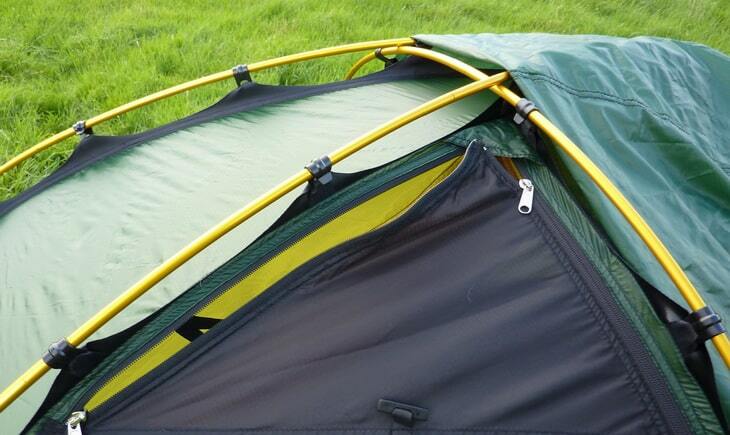 Otherwise, damage can occur to the tent or you, which could be harmful. It is not always ideal to sleep outdoors when the weather is cold. Having warm gear will ensure you stay toasty during the frigid temperatures. There are many items on the market for campers that help with staying warm. Warm clothing can make a huge difference. You can still enjoy nature, no matter the weather. While the temperatures are cold, you might have to wear bulky layers at times. 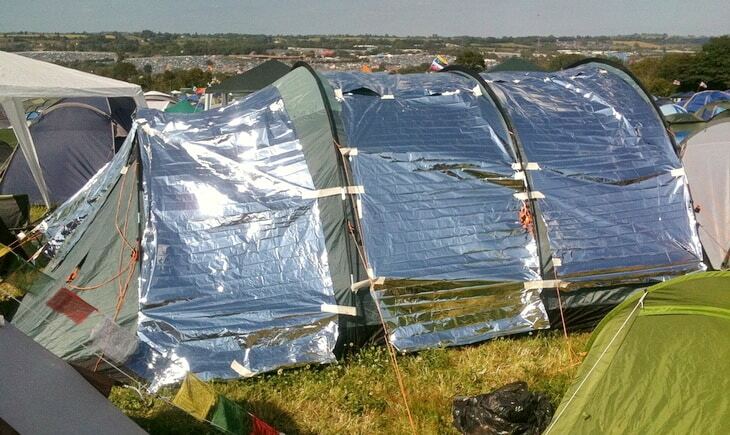 You can not leave your tent if you want to keep the heat inside of it. Waste and trash will have to stay in the tent until morning when it can be properly disposed of, or you will risk losing precious heat. If you are not prepared, you risk freezing and getting frostbite. Using these tips can keep you from freezing during the night. Staying in the tent and using blankets and other ways to keep heat in will make a huge difference. When the weather is in the single or below zero temperatures, you need to do everything in your power to create and preserve heat. It is not always about the tent warmth. Remember, you need to have the proper warm clothing and proper warm sleeping bag and gear to round out the experience of staying warm. Use items that will buffer you from the ground so the cold from the ground floor does not come up to your body. Remember, you should never wait until you are cold so you can warm up. Being properly prepared by planning ahead on clothing and sleeping gear is the difference between being cozy or chilly. 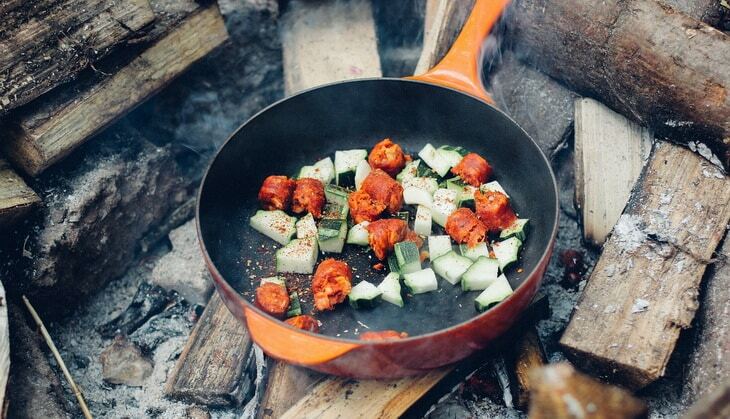 What do you do to stay warm while camping in colder weather? Do you have any stories to share about winter camping or backpacking? Tell us your thoughts below in the comments. We enjoy hearing from our readers! Henry was hiking since he was 4. 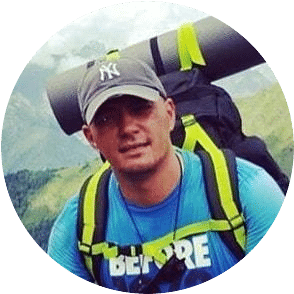 He was lucky enough to be born in Boulder, Colorado and enjoy Rocky Mountain National Park hikes growing up. His favourite is Longs Peak, which rises to 14,259 feet (4,346 m) above sea level. It is the highest point of the park. Henry likes to explore new hikes and spend his spare time in the wilderness.